The soldier and lance don't get along, so it will be easy to catch this enemy off guard. When its HP gets low, the lance goes nuts. Grab it with Lance Tug to attack surrounding enemies. A good strategy is to lower its HP and wait for the chance to use Lance Tug. The Lance Soldier is an Emblem Heartless that is introduced in Kingdom Hearts II. The Lance Soldier is a tall, skinny, humanoid Heartless with a spherical, black head with glowing yellow eyes. Its hour glass-shaped helmet, armored boots, breastplate, and gauntlets are all orange. The top of the helmet sports a short, curled, orange antenna on it. It also seems to wear black pants. Its Heartless emblem is on its breastplate. The soldier's lance is black with a silver, riveted base. Its handle is black and has a spiked ring around its center. The base of the lance sports two curled, silver protrusions that resemble ears or horns. The lance has a jagged-toothed maw and angular, spiral, red "eyes." In Kingdom Hearts II Final Mix, the Lance Soldier's helmet, gauntlets, and boots are silver. Its breastplate and pants are dark violet, and its antenna is red. The lance is yellow with a dark blue base and orange spiral "eyes." 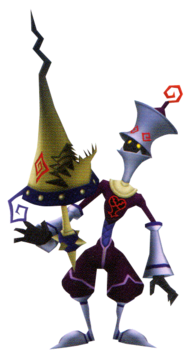 The Lance Soldier's name references the Heartless's nature as a soldier that uses a lance as a weapon. Rush Attack (突進攻撃, Tosshin Kougeki? ): Runs at Sora before tripping and throwing its lance a short distance. Rampage (大暴れ, Dai Abare? ): Raises its lance before spinning in a frenzy, leaving it dizzy afterwards. Yari Runaway (ヤリ暴走, Yari Bōsō?, lit. "Spear Runaway"): When low on health, the lance escapes its grasp for a short time. Once caught, the lance lifts the Soldier into the air and flies about, damaging anyone in within its range. The Lance Soldier is not too difficult to defeat, but its attacks are quick and can sometimes be hard to defend against. In addition, it has an attack that renders it invulnerable to magic and most normal attacks, while it zips around the area at high speed. When it utilizes this move, it can become quite a threat. The best technique is to simply use the reaction command, Lance Tug. If timed quickly enough, Sora can get away with little or no damage and slice out the majority of the enemy's health bar. If the Heartless does not use this attack, Blizzard magic can be an efficient way to take the enemy out, provided Sora has enough MP reserved. ↑ The Lance Soldier drops (1) Drive Ball x10 when Lance Tug is performed, and (1) MP Ball x1 if it is hit while performing Lance Frenzy. This page was last edited on 20 March 2019, at 20:30.